It strikes me as very odd that I’ve never written about ice cream here. This is because it’s my very favorite food of all time. I won’t admit how frequently I eat ice cream each week–hopefully family members will practice restraint with their comments on this particular post. But really, ice cream makes me very happy. Growing up, Bon Boniere was our little local ice cream shop downtown. Sometimes when I’d get home from school, my mom would promise that if I was lucky, maybe my dad would feel like going out for a cone later. Then the obsessing would begin: M & M or Bubblegum? It was like my mantra as the Brady Bunch wrapped up and dinner time grew near. I’d hear my dad pull up the driveway and know that I should give him a few minutes to put down his briefcase before I bombarded him with the all-important question of the evening: can we go? Then there were my teenage years when I ate Kristin Hook’s family out of house and home. I’d like to take this moment to apologize to Kristin’s mom: you kept buying that Rocky Road and I kept eating it all. You never said a word although I’m sure you had many to say. And then off to college where Black Jack Pizza decided it’d be a great idea to deliver pints of Ben & Jerry’s ice cream to hungry college kids. For free. The kicker? There was a $5 minimum so you had to order at least two pints. Thank you Black Jack Pizza for my freshman 15. You’re solely to blame. So I’ll cut through a few years (or, er, a decade) and tell you about the last week at my place. The beautiful thing about my building is there is this little corner store right below me that is open virtually 24 hours a day. Feel like grapefruit juice first thing in the morning? No problem. Out of toilet paper? Done. Hunkering for some late night ice cream? Hassan’s got you taken care of. Now the thing about Hassan is he doesn’t let you remain anonymous as just another customer and he has a miraculous memory. He always comments on what I’m buying and asks how I liked whatever I bought the day (or week) before. Hassan has noticed that I love ice cream, he remembers what kind I buy, and he’s started ordering more of those flavors. I started to realize this very recently when I walk in and he greets me with “Oh hi, Miss. No more Mission to Marzipan tonight,” he chuckles. “I’m so sorry. But I have your Mint Oreo Cookie. I ordered extra this week!” He chuckles again and I start to think maybe, just maybe, Hassan is mocking my eating habits. Even if he’s not, it becomes clear I’m spending a bit too much time at the corner store. So I vow to give up ice cream. And that lasts about 18 hours. Then I vow to start making my own. And here we are. Hassan and I need some space. And you need this recipe. I’ve experimented with making ice cream before, but it’s turned out more like ice milk: just a mixed up frozen combination of milk and sugar. But this is my first foray into custard-based ice cream and it was incredibly easy and turned out beautifully. I did adapt the recipe after reading some of David Lebovitz’s advice on ensuring your homemade ice cream remains soft like the store-bought kind. He encourages adding alcohol. It doesn’t take much to sell me on that one. So here we are: homemade ice cream with a little splash of vodka. You won’t taste it–but it makes for a softer consistency. You can read the rest of David’s tips here if you’d like. 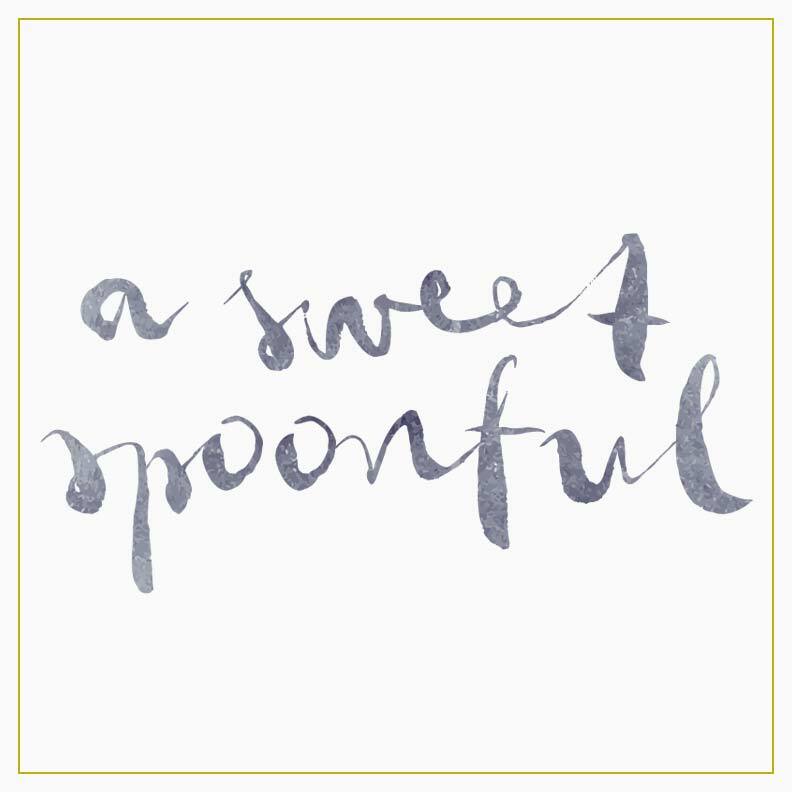 So I’m starting to look ahead to my next flavor already–any favorites you like to make at home? Use any berries you’d like for this ice cream. 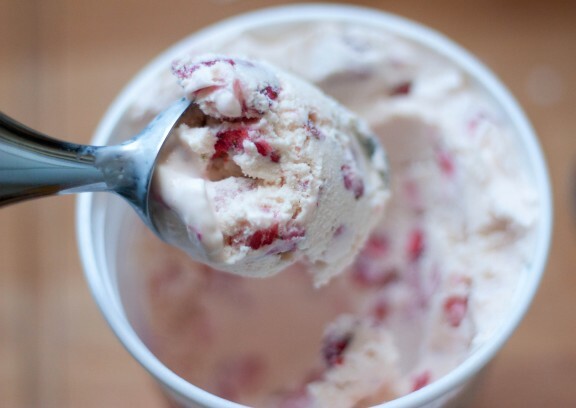 Just make sure to cut up the pieces quite small–nothing good about big frozen, icy chunks of berries in your ice cream. Also, while I call for vodka here, you could also use kirsh or a liquor that would bring out the taste of the berries. I chose vodka because it has a neutral flavor and I always have some around the house, but play around with whatever inspires you–it’s not enough to make a big difference flavor-wise. Combine the milk, 1/2 cup of the cream, and 1/3 cup of the sugar in a 3-quart sauce pan over medium-low heat and cook, stirring occasionally until just warm. In a separate bowl, whisk together the yolks, 1/3 cup of the remaining sugar, and the salt and whisk until slightly lighter in color. Very slowly pour half of the warmed liquid into the yolk mixture, whisking continuously. Next, pour the yolk mixture back into the saucepan and cook over medium heat, stirring constantly until it thickens and coats the back of a spoon. Do not allow for it to get hot enough to boil. Heat slowly and watch for thickening. Once thickened, take saucepan off of heat source. Set a bowl over an ice bath, then strain the custard through a fine-mesh sieve set over the bowl. Stir in remaining 1/2 cup cream and the vanilla and continue stirring until cool. Cover and chill in refrigerator 1.5 – 2 hours. Add remaining 1/3 cup sugar to chopped berries and put in the refrigerator in separate little bowl. Once the custard has chilled, stir in the berries and vodka and freeze in an ice cream maker according to manufacturer’s instructions. Place the churned ice cream in a dry plastic container and cover with plastic wrap directly on top of the ice cream. Chill for at least 2 hours or until set up. Storage: Stored in an airtight container in the freezer, the ice cream will be good for two weeks. My dad is the Ice Cream king in our family. I grew up eating fig ice cream (trust me, it's good), but last summer for a going away party that my parents gave us, my dad made three kinds--coconut, coffee, and strawberry. Divine! 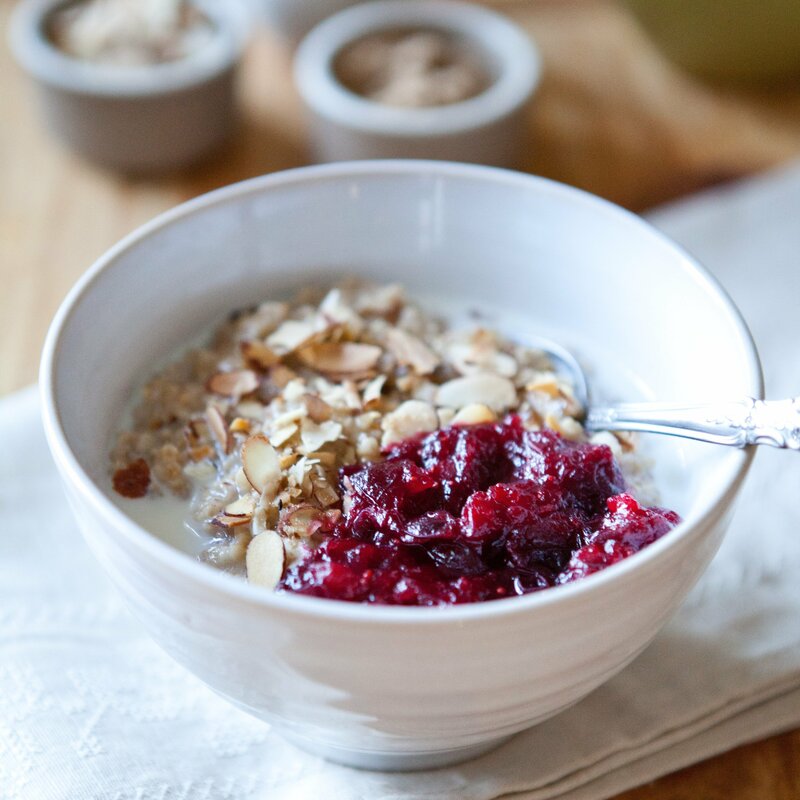 So glad to have this recipe - time to get that Cuisinart bowl into the freezer! I just gotta get all the compost out of the way first. I also live on top of a market, and literally across the street from an ice cream store. I can see it from my bedroom window. It's a blessing and a curse. I think you'd get along very well with my sister. My favorite quote of hers: "Most people say they love ice cream. But what they don't know about me is I really really f***ing love ice cream." Janet! I'd be rolling out the door if I lived across the street from a legitimate ice cream shop, and yes, I think your sister and I would be fast friends. I think I know the spot up in Sebastopol: Screamin Mimis??? LOVE that place! The alcohol sounds like a really useful tip! It's so dissapointing when homemade ice cream comes out hard. You made my morning with Hassan's memory of your most frequent flavors. That's truly life in the city. And, Janet, I know that ice cream place in Sebastopol very well. Mmmmm! I don't generally like strawberry ice cream (very curious, I know!) but this might convince me. I kind of want it for breakfast! Ha, I know! Believe it or not, I don't go as often as I thought I would, maybe because I'm comforted in knowing it's always there! The walkaway sundae is on my list, though... gonna have to do that soon! PS: Had three different combinations of the ice cream at Picco last night. So, so good. Okay, now you took ice cream to a whole other level - VODKA! I think this should be made into a drink, kind of like a dreamicle! Hassan sounds adorable, I love reading about all these mini-communities that spring up around quotidian activities like grocery shopping, etc. Ok maybe I'm just viewing it through rose-tinted glasses! If you're looking for flavors to try, I highly recommend Brown Butter - it makes ice-cream even more addictive than it already is. Ice cream is super huge in my family. I saw in your archives you went to Mitchell's Ice Cream in San Fran--I grew up on that place! Every time I visited San Francisco, it was the first stop we made. I was in SF just this past weekend and the first stop I made was to Bi-Rite, and it was pretty amazing. The alcohol tip sounds great. I'll be sure to use it! This was a trip down memory lane! I like ice cream, but when I was little it was my favorite (after straight frosting). I love "Bon Bon Boneire" and while my favorite flavor was strawberry, reading your post I could actually taste their bubble gum and their M&M ice cream...pure heaven. I don't think any future M&M or bubble gum ice creams have measured up. I remember eating ice cream at your place when we were little too. Your parents always served much bigger servings than my parents, in latte bowls I think? How is Marzipan Maddness? I L.O.V.E. marzipan and that flavor is haunting my dreams. It is 1st on my list of things to try when I start eating dairy again. Hi Alice! Mission to Marzipan is unbelievable. I love almond and it's has a big swirl of marzipan...I don't doubt my parents served relatively large portions of ice cream or that they were out of latte bowls. Sounds about right...I'll thank them maybe for my high cholesterol. No dairy for you--allergy? I've never tried making my own ice cream before, but I've always wanted to! What a cute chubby little glass bowl. I love it and want one- or a few. Where can I buy some? I love ice cream. If I was stranded on a desert island and could only have one food item - sigh - yes, it would be ice cream... a zillion kinds of ice cream. I made my own all of the time - usually with my Thermomix, but (blush) I do have three ice-cream makers!! When I get on a roll, I get on a roll, and hate to wait for the canister to cure the ice cream before I can make another. Patience is not one of my stronger virtues. Well, I am actually more patient that one may think - but time is an issue, always - and more makers help with the use of the time, for sure! I am glad we found one another. We will definitely be sharing ice cream recipes. I don't have this one - and it looks lush! But I have many many that will give you a brain freeze well worth having. Hi Valerie. The little cup is from Anthropologie a few years ago. And yes, pass on any good recipes you come across please! Summer's a 'coming. 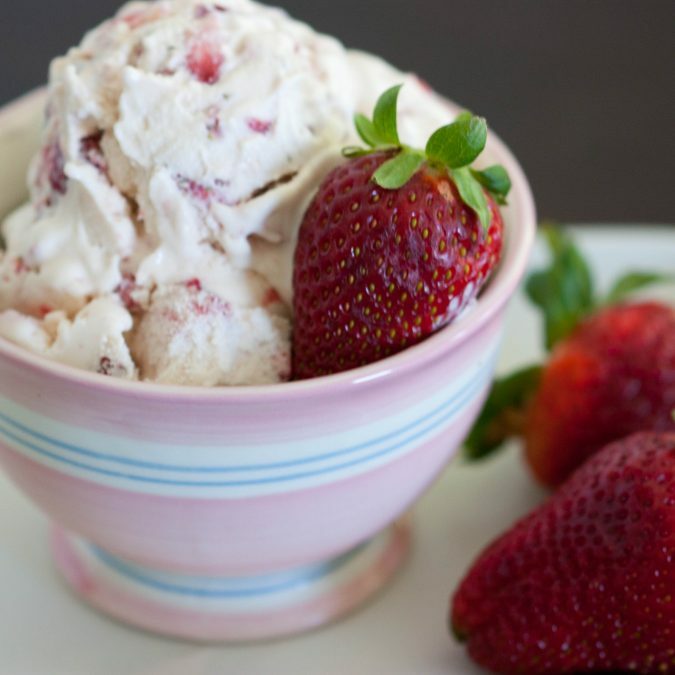 Homemade strawberry ice cream = heaven. Congrats on your hat trick, Megan! Ready Made, Food in Jars and the Food News Journal - all in one week! It's so awesome to see the national recognition your work is getting. Thanks, Mary! Yes, it's been an unusually good week around here. Thanks for all of your sweet support! I can't recommend David Lebovitz's The Perfect Scoop highly enough. I have made many of his recipes and every single one is incredible. Gianduja Gelato, Honey Lavender, Tiramisu, even just vanilla. A-mazing. Thanks, Dana! So funny...I was just at our cool, local book shop (Green Apple Books) selling some old mysteries in hopes of getting a little extra money to buy cookbooks and I stumbled upon a used copy. I've been reading it at night and am in love with his tone, photos, recipes etc. Can't wait for my next go-around! Thanks for the recommendation. Too funny about Baskin Robbins--sounds like something I would do for sure! Perfect timing! 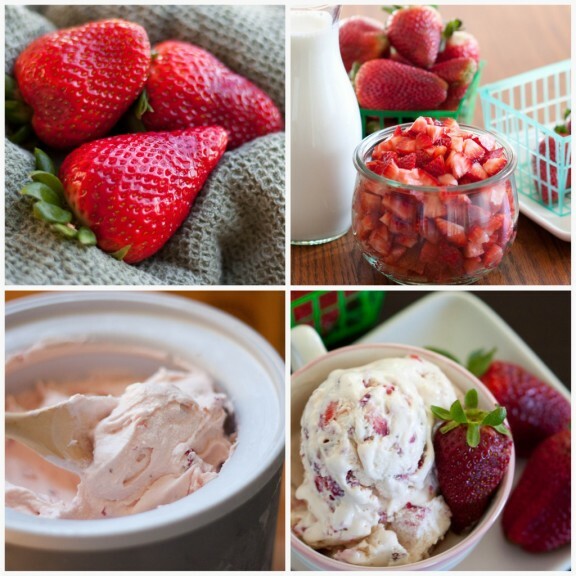 I've been hunting for a strawberry ice cream recipe for Memorial Day weekend. Looks amazing! Just beautiful! Wish I had an icecream maker.... If I did though I would make stuff like this all the time which might not be great for my waistline!! Just a thank you for the nice words about our (Bon Boniere) ice cream and a follow up on your strawberry recipe. We actually macerate the strawberries in our ice cream with Bailey's Irish Cream (under the law to include no more than .5% alcohol in the finished product) and the sugar overnight. You might try this instead of the vodka, and if you are not selling it commercially, add a tad more. It actually is quite good and gives a wonderful 'mouth feel'. Thanks again. 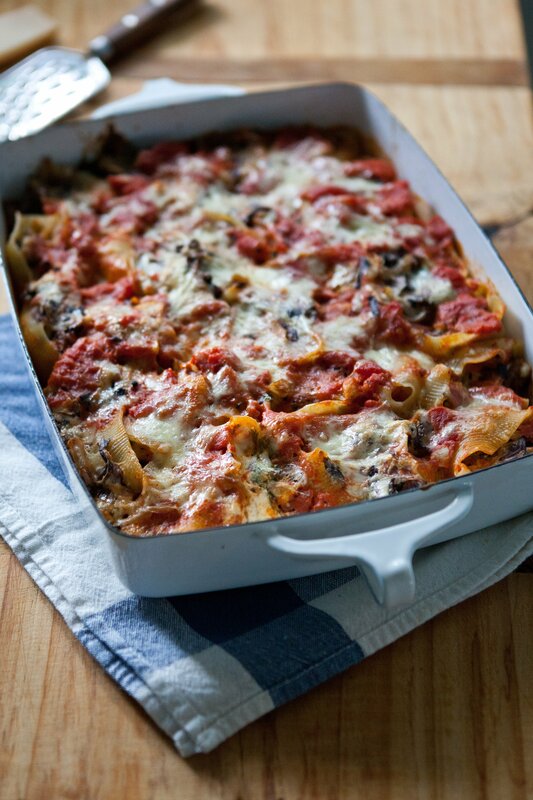 Thank you Megan for posting this recipe and sharing your experience. I am in love with David Lebovitz, and am now in love with this recipe. The touch of alcohol to the mixture was such a great suggestion for people. This is a such a tasty base. Perfect for any other fruit add-ins. My boyfriend and I were so excited about this recipe that we kept dipping into the ice cream before it was fully frozen. It has literally been forty-eight hours since making my first batch and I am already confirming that I have the ingredients to make a second batch. This time I'm thinking banana with dark chocolate chips. This is complete addiction!